Psshh, volcanoes. They don't scare Bobby. Not one bit. BATON ROUGE, Louisiana - Governor Bobby Jindal, noted exorcist and cancer curer extraordinaire, today took unprovoked potshots at innocent volcanoes located throughout the Pacific Northwest and Alaska. The outbursts come in response to President Barack Obama's new $800 billion stimulus package; specifically, the section which addresses the dire threat volcanoes currently pose to the United States. Obama's plan would allocate over one hundred million dollars towards "the appeasement of volcanoes located throughout the United States, to include gifts of unspoiled virgins and the like, in the hope of preventing potentially annoying eruptions." The money will mostly be spent on replacing faulty or old machinery used to study volcanoes, since most of this machinery must be made out of wood and therefore is prone to bursting into flames when in close proximity to a volcano. Jindal has voiced his rage on the subject, far outstaying his welcome on such well-reputed Louisiana newscasts as What's New on the Bayou and Good Morning Swamp and Peat Bog. Despite clinging to America's attention for longer than isn't annoying, he has continued in his quixotic rage against the very real danger that is volcanoes. "Why are we wasting money on such frivilous pursuits as 'massive deadly volcano eruption prevention'?," he asked of reporters today. "This is merely another example of wasteful spending in Washington. The only eruption this administration should be worrying about is the eruption of spending going on." He went on to add, "Did you like that line about the eruption of spending? I'm particularly proud of that one. I mean, I have eight full-time speech-writers, a publicist, and a dozen or so interns that really don't have any functions, and I came up with that myself! Impressive, right?" See? Totally harmless. Maybe some ash on your windshield, but that's it. 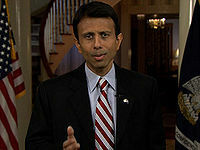 Not content with merely bashing the policies of the new president, Jindal plowed on yet again. "Volcanoes should be the least of this country's worries right now. Will volcano research and appeasement solve this financial crisis? My fourteen executive economic analysts say "probably not". I personally would like to call out the volcanoes of the United States, and challenge them to show us why we should throw this money away and continue the wasteful Washington liberal spending spree." When it was pointed out that this might not be a good idea, Jindal continued, "Oh, come on, what are the volcanoes going to do? Erupt? Oh no, look out residents of Pacific Northwest, there's magma in my hair! Give me a break." Many people are displeased with Jindal's remarks. Many volcanoes were also, but UnNews reporters do not enjoy health insurance which covers acts of volcanoes, so a first-hand reaction is not available. However, the intended recipients of the "volcano money", as it is coming to be called, could not be more outraged. "This is a sad day in the history of the U.S. government," said Tommy Lee Cheadle, head volcano researcher at the USGS. "Without proper funding, several volcanoes in the Western United States will stop receiving the attention they so desperately seek, and many could over-react in an eruptingly strong way." When told about the direct challenge to the volcanoes from Governor Jindal and the subsequent taunting and then asked if they would affect the volcanoes also, Cheadle began running in the opposite direction from the volcano at quite a surprising clip. This page was last edited on 5 June 2012, at 01:51.